An armed robber’s family is irate after a bungled robbery sends him to the hospital. 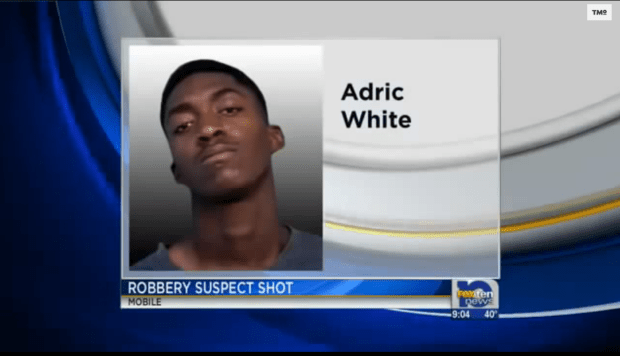 Eighteen-year-old Adric White entered a Family Dollar, wearing a mask and carrying a gun. He held the employees at gun point, and began ordering them around, when a conceal-carry Good Samaritan noticed the crime in progress. Knowing that seconds can count when police are minutes away, the Good Samaritan entered the store and told the criminal not to move, with his own firearm pointed directly at the robber. Instead of following the instructions, Adric spun around to face the Good Samaritan, which earned him five well placed bullets. The young criminal survived the shooting. Adric’s family became involved, after hearing about the shooting, though not in the way that most would like to think. Instead of giving a wounded Adric the speech about crime and consequences, and how lucky he was to survive, the family turned against the Good Samaritan, arguing that if the customer’s life wasn’t immediately in danger, he should have left the store and done nothing. They argued that he should have minded his own business. Most law-abiding Americans already know the flaws such arrogance can develop. When a man decides to take things that do not belong to him, especially under the threat of a weapon, it’s not an unreasonable assumption that the robber would also take the life of the person he is stealing from. Pointing a gun at anyone while instigating a crime is a threat to life, which is defensible by anyone, including bystanders. It’s a fairly reasonable assumption to make that, if the roles were reversed, and Adric’s family was being held at gunpoint, and their boy shot the criminal, they wouldn’t be scolding him for it. However, since that isn’t the case, and Adric is the criminal who got shot, they’re on a tirade that won’t end well for Adric, or their family. The media is respecting the Good Samaritan’s desire to remain anonymous, a man who has legally been carrying his concealed firearm for the last four years. This was the first time he needed to use his weapon in defense of another, which is his civic duty that he takes seriously. He expressed remorse, saying that he really didn’t wish to shoot anybody. However, when the lives of the innocent were at stake, he stepped up and did the right thing. To those employees and the rest of the community, the Good Samaritan is actually a hero for not running away. Though it remains unclear where the five bullets struck Adric, he should be grateful that he was able to limp away from this experience, and hopefully use this as a lesson to turn his life around. Tax Payers should not be responsible for giving people cash assistance to people who are simply going to use that money to buy illicit drugs. Also many of those tax payers are drug tested for their jobs. If they are getting drug tested for working then people getting paid to do nothing should also be required to get drug tested.